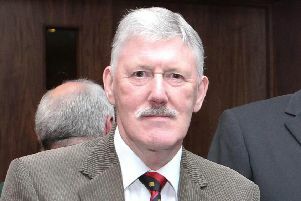 The former principal of Ulidia Integrated College has paid an emotional tribute to a founding governor of the school whose funeral took place today. Eugene Martin recalled that he first met George Leslie during an interview for the post of principal, on April 16 1997. Former principal of Ulidia Integrated College Eugene Martin. He said: “At that time, I knew very little about the school that Brenda and George and the other members of the steering group envisaged creating. “What was this ‘steering group’? 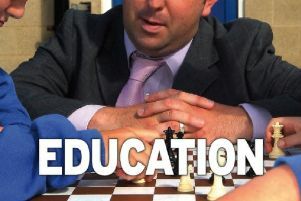 What was its vision for an integrated school in the Carrickfergus area? “Two days after being appointed, I walked into Brenda and George’s house in Carrickfergus. Brenda and George were leading members of the steering group - and I was greeted by over half a dozen smiling, friendly and determined faces. “It was a very strange yet very rewarding first meeting. But what followed during the next three hours was like an episode of ‘Yes Minister’. “The steering group quizzed me on every educational issue under the sun. We discussed the curriculum we wanted to offer – the subjects that would be studied. “We discussed the pastoral system, and how we wanted it to be the best there ever was in any school anywhere. “We discussed parental involvement in the school, and how the Parents’ Council could inform the governors of the school. “We even discussed the timetable and the school trips that would be on offer to our first Year eight pupils. “I was having great difficultly directing the conversation towards more urgent matters that needed to be addressed. Eventually, George said ‘right, that’s it for tonight and stood up. “Basically. Get out I’m going to bed. I said, hold on a sec, I have a few questions. “He sat down again. I asked, “George, how many pupils have we got enrolled so far? “A site identified? – nope. Any staff? – pointing a finger, he said, you. Money – none. “He just looked at me and said, ‘stop worrying Mr Principal, all will be right in the end. “Three hours later – while driving home to Belfast - I couldn’t help but think that we were all mad. “I kept thinking of the meeting I had just attended: Hadn’t we just ignored the fact that we didn’t have any students enrolled yet? We didn’t have any school buildings to put pupils in. “We didn’t even have a site identified, on which to put the school, and we definitely didn’t have any staff appointed - and maybe more importantly - we didn’t have any money to run a school. “And we were supposed to have everything in place by mid-August at the lastest – three and a bit months away. “Believe it or not, I was still smiling as I drove home, and, as George said, all was right in the end. “He tirelessly trawled Carrick, Whitehead and Larne for possible students, visiting homes after work each night for two months and by May 1997, we had 43 of the 60 we needed to be enrolled to get independent funding from the Integrated Education Fund. “He then organised a parents’ information meeting at Whitehead Primary School, where I was to be introduced as the new principal. “First time out as principal, I was very nervous. As I was about to take to the stage, he slapped me on the back, said. Your problem now, Mr Principal. We need 60. Better make it a good one. We got 63 and Ulidia was born. “The school stands as testimony to George and Brenda and their vision for something better for the kids of East Antrim. That is the legacy George has left us. “George has been the most passionate supporter of Ulidia Integrated College. Since 1997 to my retirement in 2016, George never missed an open day or night, a prize day or any special school event. He rarely missed governors’ meetings. “Over that time, George and I grew close. He frequently visited the school and I never tired of seeing him. We had a cup of coffee every Monday morning at the school, and in later years, at Papa Browns on a Friday – his office as he called it. “He was the most loyal person you could ever meet and I am proud to have called him my friend. “When I retired, he gave me a card, which I still treasure, and the words are quite moving to this day. “I knew I would be writing these words at some date, but now that the time has come, it is no less difficult. It has been a pleasure knowing and working with you these past 19 years or so. Lots of intense but productive meetings all conducted with mutual respect.